According to reports, UFC 119 has a new co-main event. Sources close to the situation have confirmed the UFC has booked a light heavyweight bout between Antonio Rogerio Nogueira and Ryan Bader. MMAWeekly.com broke the news earlier this morning regarding the contest. It was originally thought that Nogueira would face former champion Quinton “Rampage” Jackson, but the UFC was unable to lock down his schedule due to his commitments promoting The A-Team movie overseas. 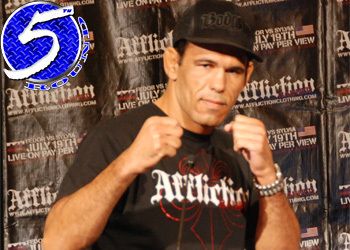 Both Nogueira and Bader have verbally agreed to the bout and are expected to sign the agreements within the coming days. The Brazilian last fought at UFC 114 in May where he took home a controversial decision over Jason Brilz, who was a late a sub for the injured Forrest Griffin. Bader owns a perfect 11-0 professional record and has posted wins over the likes of Keith Jardine and Eric Schafer. UFC 119 is set for September 25th and will emanate from Conseco Fieldhouse in Indianapolis, Indiana. The cards’ main event has not yet been announced, however it will NOT be the heavyweight title bout between champ Brock Lesnar and Cain Velasquez.